Up until a few years ago I wasn't into casual dressing... I lived in dresses paired with tights and boots, maybe with a chunky cardigan thrown over the top if I needed to dress it down a little. Fast forward to now, and I'm all about comfort, yet I still try to keep some style in the mix too. I have a few go-to items in my wardrobe at the moment that I just can't seem to get enough of, constantly repeating outfits and rotating pieces throughout the week, but who's to say that's a bad thing?! 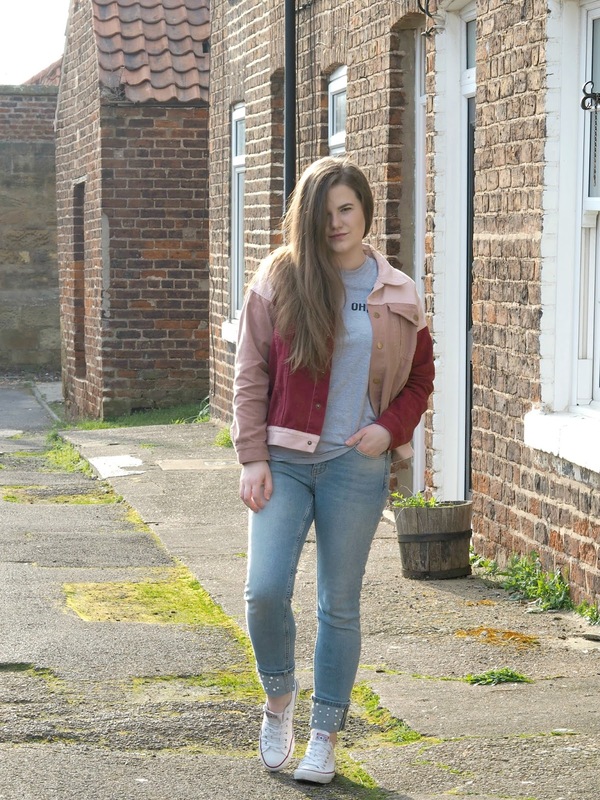 I have three or four favourite pairs of jeans, a couple of jumpers that I love, a handful of slogan t-shirts (which just so happen to be my new addiction) and my Converse, which seriously, everyone should have... They're not only comfy, but practical, look great with everything and stay in style season to season. Styling slogan t-shirts is so easy and effortless too, they make a real statement, and when worn with a denim jacket or blazer, you just need to add a pair of jeans and you're good to go. Whether you're going for drinks and a meal, a walk in the park, shopping or anything in between, I always think they work. I have got myself quite the collection at the moment, it definitely feels as though every shop you go in at the moment is offering up some cute new options. This 'Oh Yes' design from LOTD is one of my most worn, it's so simply dressed up or down. I like anything with a quirky slogan, a nice font or a cute embroidered picture... And if you can't find just what you're looking for, you can always design your own custom T-Shirts for yourself and your friends. I really want one with a coffee cup and a Friends quote on the chest! I find these kind of outfits ideal for this time of year too... Perfect for that in-between weather when we're told it's Spring but feels like Winter for the majority of the time! They also come in handy for those of us who haven't had chance to go shopping for our Spring wardrobe yet. Please reassure me and tell me that I'm not the only one who hasn't even started to think about that yet! My only recent purchase is this colour block jacket which I have already confessed to being obsessed with over on my Instagram grid, I just can't get enough of it! I love absolutely everything about this outfit! You look stunning..
Love love love this look! :) I'm all about simple and basics and ALWAYS jeans!